I love lemony herbs, and my favorite of all is Lemon Verbena. It has a delicious lemon fragrance that is wonderful in the teapot, baked goods, and scenting the home. As much as I love Lemon Verbena, it doesn't particularly love my Texas climate. It burns up in the summer and freezes in the winter, so I treat it as an annual or a very tender perennial. But in my book, it is well worth growing, even as an annual. It dries well, so thankfully I can order a supply from Mountain Rose Herbs if my harvest is slim. 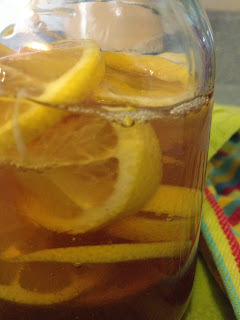 I'm not the only one who loves this lemony gem- here is a blog by the Lemon Verbena Lady! This is a link to her recipes that feature Lemon Verbena. She has great information on her blog about all kinds of herbs, not just Lemon Verbena, so do spend some time perusing her posts. How do you use Lemon Verbena in your home?